In 1921, the 35 year-old Faber set up his own consultancy firm — the eponymous Oscar Faber — with £2,000 of his own money. The fledgling firm employed two other engineers, an office junior and a typist. They worked from three rooms on the second floor of a private house at 5 South Street, Finsbury Pavement, in the City of London. The first recorded job was the Regent Cinema in Brighton. The company's expertise combined structural and mechanical engineering, with help from two very different engineers who would influence the company's establishment and development. They were Stanley Vaughan (1895-1979) and John Robert Kell (1902-83). Both men would become partners when Faber changed the status of the firm from sole proprietor to a partnership in 1948 (Oscar Faber & Partners), and both remained with the company until their retirements, long after Faber's death. Vaughan (known as Jim) was one of the original staff members, predominantly a structural engineer, who had met Faber in 1919 at Trollope & Colls and joined Faber's new consultancy as Chief Assistant. He had begun a civil engineering degree at City & Guilds College in 1912, but was called up for World War I (1914-18), suffered injury at the Battle of Loos in September 1915 and subsequent internment by the Germans, before resuming his course after the war. In 1923 Faber and Vaughan designed a two-tier reinforced concrete grandstand for Lord's Cricket Ground, working with architect Herbert Baker (later Sir, 1862-1946). The structure ran along one side of the ground in front of the main scoring box and across the Nursery End. Its ingenious suspended deck, supported on central columns carrying balanced cantilevers, ensured that spectators on the lower tier had an unimpeded view of play. A graceful arched roof topped the upper tier. An opportunity for overseas design work was the Shanghai Custom House, which Faber and Vaughan worked on in 1924. The new building (completed in 1927) replaced several earlier ones on the same spot, and had to be founded on the fine soft mud deposited there by the River Yangtze. The building is 137m long and almost 43m wide, with nine storeys and an 81m high tower at the front — located on the Bund, Shanghai’s commercial centre — and seven storeys at the rear. Since the mud becomes softer and more thixotropic (tends to flow under pressure) with depth, the pair chose a combination of piles and a concrete raft foundation as the best solution (later adopted for many modern buildings). At the front piles were spaced 1.2m apart, with fewer at the rear, and an allowance for 300mm of settlement included in the design. Faber still questioned the use of elastic design theory for reinforced concrete — in widespread use at the time — and preferred what he called 'plastic yield' theory. This was a forerunner of limit state design, which would be adopted as a British Code of Practice (CP110, The Structural Use of Concrete) in 1972. Faber's ideas, refining his earlier books of 1912 and 1920, were published in the 1924 volume Reinforced Concrete in Bending and Shear: Theory and Tests in Support. Working with H.L. 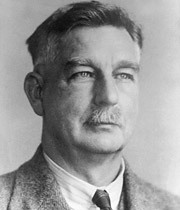 Childe, the editor of Concrete & Constructional Engineering (C&CE) magazine, he also produced the 1924 Concrete Yearbook. In June 1925 Faber was elected a Vice President of the Institution of Civil Engineers (ICE), though he was never to attain the Presidency. In the same year the growing consultancy moved from South Street to larger premises at 37 Duke Street, Mayfair. John Robert Kell (1902-83) joined the consultancy in 1925, and focused on mechanical engineering. He did not go through university, but gained his skills directly through a practical apprenticeship working with boiler-makers and pipe-fitters. He would begin his long career as a heating and ventilation expert with the project to rebuild the Bank of England building in the City of London. Both Kell and Vaughan admired Faber immensely, and Faber in turn relied on their expertise. Overall, the firm worked effectively and efficiently, each of them complementing and developing the others' skills. Examples of these early joint successes were manifest in jobs such as the Bank of England rebuilding (1924-42), India House (1925-30), Royal Horticultural Society Hall (1926-28), Northolt Park Racecourse stands (1927-29) and Durham Castle underpinning (1927-45). The work for the Royal Horticultural Society involved building a new hall (now called Lawrence Hall) adjacent to their existing premises. Faber and Vaughan, with architects Easton & Robertson, designed the interior roof and tiers of clerestories to be supported on near-parabolic reinforced concrete arches. Faber's earlier work at Lords' led to a commission for the grandstands at the now-demolished Northolt Park Racecourse. Faber, again working with Vaughan, produced another cantilevered structure that provided race-goers with consistent visibility of the entire ground. At Durham Castle he would devise a, now largely invisible, solution that combined steel ties, concrete anchorages and cement grout. Faber continued to expand his knowledge of both concrete and steel, though his 1927 book Constructional Steelwork Simply Explained is thought to have been written mostly by Vaughan. Faber's most notable paper of the decade was Plastic Yield, Shrinkage, and Other Problems of Concrete, and their Effect on Design, for which he was awarded the ICE's Telford Gold Medal in 1928. He also presented a paper to the Royal Institute of British Architects (RIBA) on The Expansion and Contraction of Building Materials in 1929. The partnership continued to expand steadily, until the Duke Street premises were becoming overcrowded. In 1931 the company moved again, to a newly built office block called Romney House on Marsham Street, Westminster. Sir Herbert Baker took the seventh floor, while Oscar Faber & Partners occupied the sixth floor. 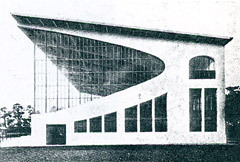 Faber, with Vaughan's assistance, designed five steel frame spectator stands for the now-vanished Northolt Park Racecourse, which opened in 1929 for pony racing. Northolt Park Racecourse stands. These images were published by the ICE in The Aesthetic Aspect of Civil Engineering Design, a series of lectures given in 1944, one of which was by Faber.